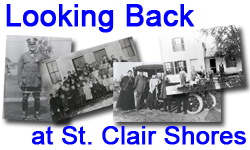 The mission of the St. Clair Shores Historical Commission is the collection and preservation of historic memorabilia and the operation of the Selinsky-Green Farmhouse Museum. The St. Clair Shores Historical Commission is appointed by the St. Clair Shores City Council. It is the responsibility of the Historical Commission to: establish policy with regard to the collecting, cataloging and preservation of material relating to the history of St. Clair Shores and surrounding area; collection, procurement and preservation of narratives of the residents of this area; display and interpretation of objects indicative of the life, customs, dress, and resources of the residents of this area; and to make available source materials illustrative of the history of the area. The Historical Commission is also responsible for the operation of the Selinsky-Green Farmhouse Museum. The administration of the Historical Commission policies is the responsibility of the City Librarian. Offices of the Historical Commission are located in the St. Clair Shores Public Library. Muskrat Tales is published twice annually. Printing of Muskrat Tales is made possible by funding from the Historical Society of St. Clair Shores. significant photos from around St. Clair Shores.